----There are many sounds one associates with boating. The gentle lapping of waves on the hull, the mornings filled with birdsong, or evenings with owls hooting in the dark woods surrounding the anchorage. But, for El and me, one of the most characteristic sounds of river running is something rarely mentioned in cruising books - the language of locks. ----Virtually every lock talks or sings, if you can spare the time from busy locking duties to listen. Small locks, either in size or lift, usually murmur with the rising or falling water in the chamber. Some even whisper. The floating bitts slide up or down slowly as the chamber slowly fills or empties. There's an occasional groan or squeal as metal skids along metal but generally small locks are to be seen and not heard. ----- A lock is an engineering marvel, the result of hundreds of years of experience and experimentation. Some are gigantic - hundreds of feet long, and tens of feet wide. Concrete walls, scarred and splotched with momentos of long-forgotten conflicts with steel barges or tow boats, may rise vertically the height of a six or eight-story building. 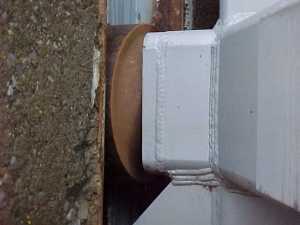 -----The steel or wooden gates at each end of the chamber often sit on concrete sills. The moveable gates often don't rise more than half the height of the sidewalls. 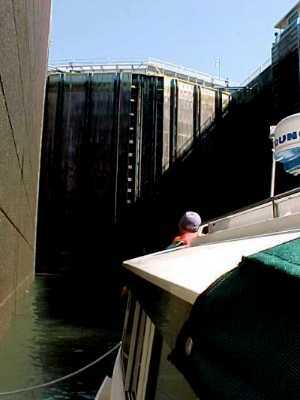 The sills are hidden under the waters of a full lock. 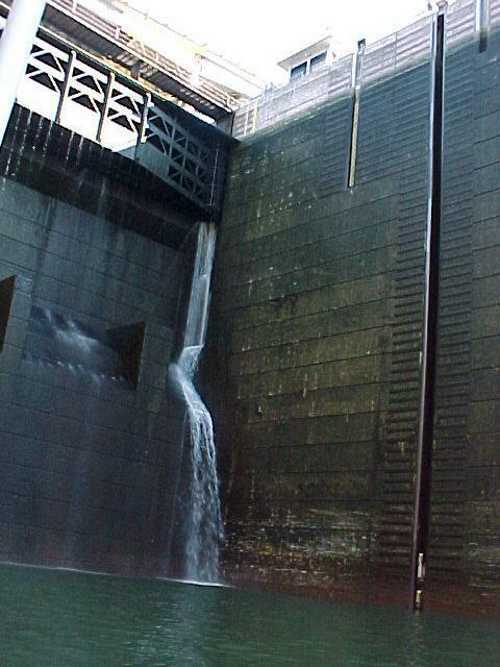 The enormous gates are forced shut by massive hydraulic rams, and sealed by the pressure of restrained water. 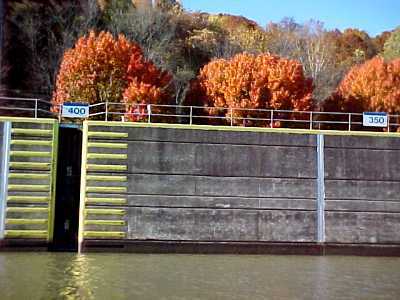 -----Locks have a simple utilitarian purpose - raise or lower boats through a dam. 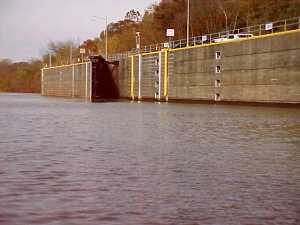 The dam is there to raise the height of upstream waters high enough to make the river navigable for commercial craft. -Inadvertently, a lock becomes an orchestral wonder. -------Water sounds are subtle quiet murmurings - swishes, hisses, whispers and whooshes. Water drips, pours, or cascades down the walls. Fountains spray outward from leaks under or between the doors. Rising or falling past the barriers of the steel works of the door or the tops of the sills, water may protest in a concerted and startling "hooosh!" 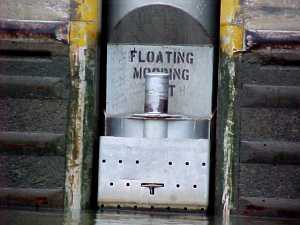 -----The floating bollards are the vocal chords of locks. The huge metal drums sliding within the metal-lined recesses of the walls resist motion. They complain with a variety of sound that defies description. -----It begins and ends with a few subtle groans and growls, as water slowly begins and ends its rise or fall. Then eight or ten metal boom-boxes reach full-throat. Imagine huge metal fingers clawing against a metal wall within a 70-foot high tomb. Every sound is magnified, ricocheting off the soaring, dark, dripping walls. It is at once melodious and discordant, harmonic and cacophonous. Shrieks, screeches, squeals, and screams cascade off the walls and reverberate in the chamber. Sound overwhelms the senses. We, and our little 22-foot boat, shrink to nothingness within that vastness of sound. We are a little rubber ducky floating in a colossal concrete casket filled with thunderous metallic reverberations. It is the concert of the lock.